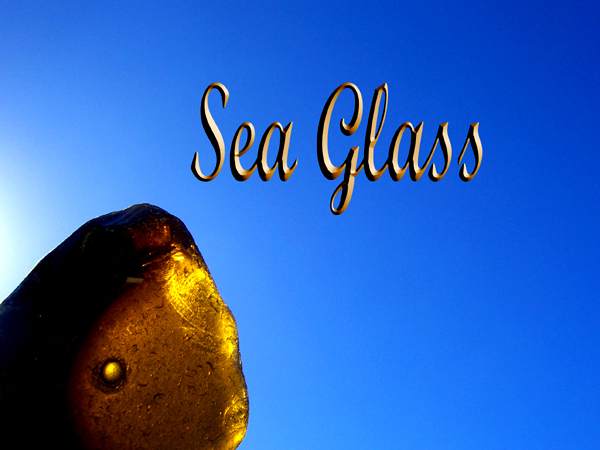 Sea Glass for Jewellery or Crafts in South Africa. 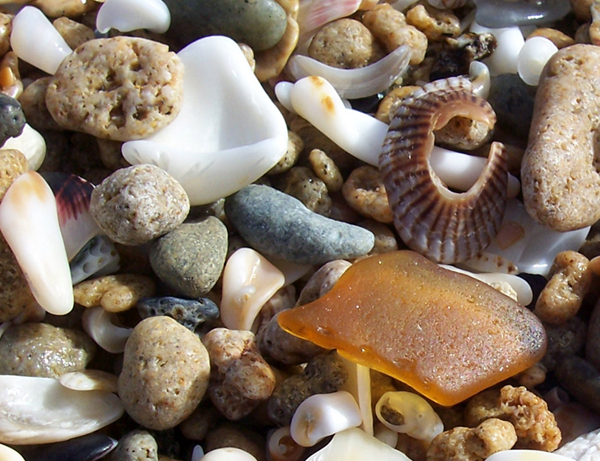 What is sea glass? Do South Africans even know what sea glass is? Okay, so not too long ago, we didn’t know what sea glass was ourselves, but now we’re hopelessly addicted to it – just like many other people are addicted to it too, all over the world. We sell some of the sea glass we find – visit our Sea Glass For Sale page on our beachy.co.za website once you’re done learning all about beautiful sea glass below. We’re South Africans living in East London, South Africa and we’re using found sea glass in fun beachy handmade jewellery items we’re making like earrings, bracelets and necklaces, and we’re using it to decorate some other handmade items like small beach house decor items. You can use it too – for jewellery, crafts, or home decor in South Africa – if you can also get your hands on some pieces. 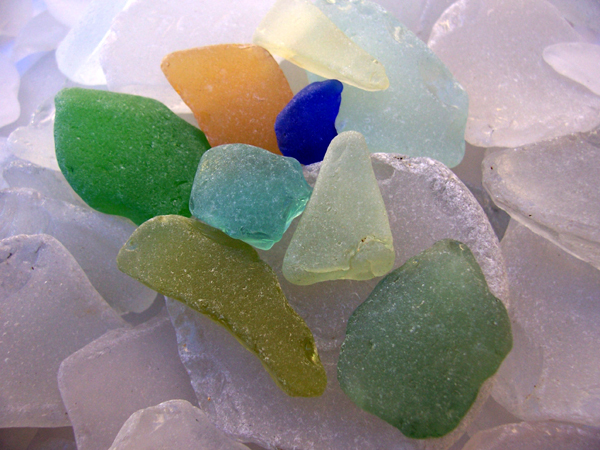 What is found sea glass? Found sea glass means somebody has found the pieces of glass on beaches in its natural state – it is not glass that has been artifically tumbled or aged in a machine of sorts. 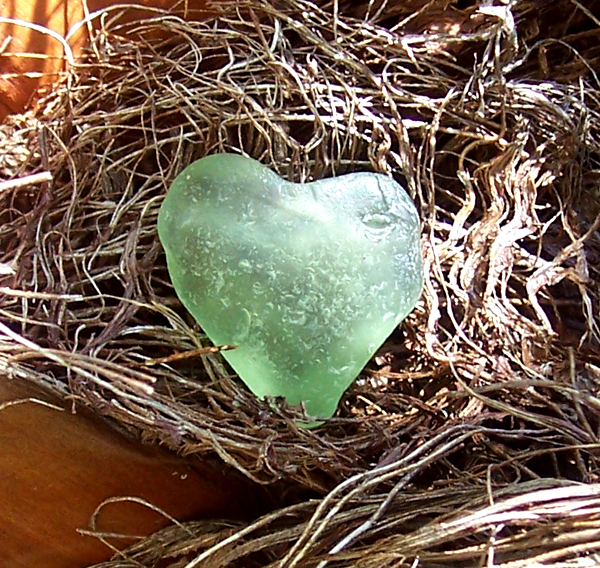 It has history or a story to it; found sea glass has romance or character; found sea glass is special. Found sea glass is not just broken glass lying on the beach. 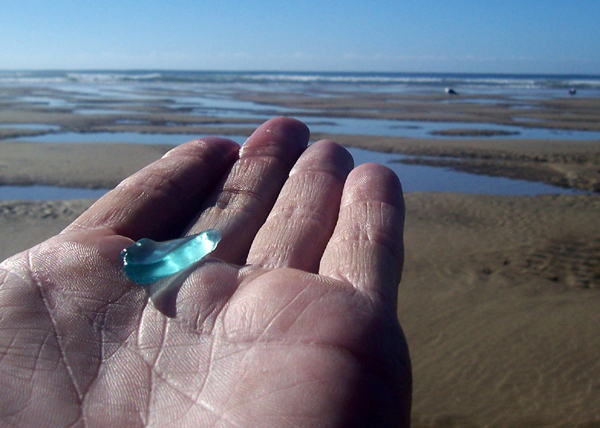 Well, glass lying on the beach is just that: glass lying on the beach, but when that glass has been lying on the beach for a long time, many years sometimes, or when it has been in the ocean for a long time and has now washed up on shore, it is sea glass. It is also known as beach glass and is (usually) broken pieces of glass bottles that is beautifully weathered and aged by being tumbled about in the waves over a long period of time, before washing up on the shore. Or if it started out as sharp broken glass lying on the beach, and if it stayed on the beach over a long period of time, it is weathered and aged by the waves, wind and rain knocking it about, and knocking it against pebbles, shingle, seashells or just the sand. Over time the glass turns smooth and somewhat milky or frosty, and turns into beautiful treasured pieces of glass. How magical and romantic is that?! 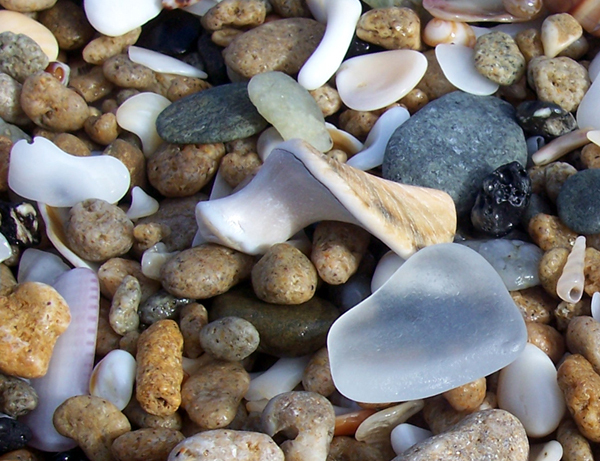 Does beach glass still just sound like trash or broken glass to you South Africans? So, if you don’t stay near a beach, or if you do but that beach has no smooth pieces of old glass on it, how are you going to get hold of some sea glass in South Africa to use for your handmade jewellery or crafts? Well, luckily we stay not too far from some beaches in the East London, South Africa area that do have some pieces of sea glass on them, and we have some in stock, so you can order sea glass from us! 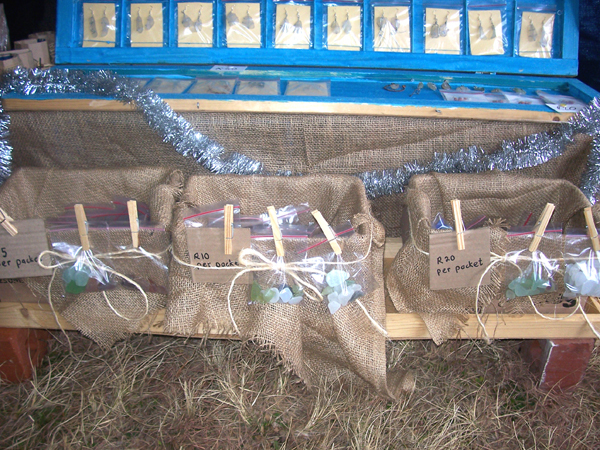 Visit our Sea Glass For Sale page on our beachy.co.za website. 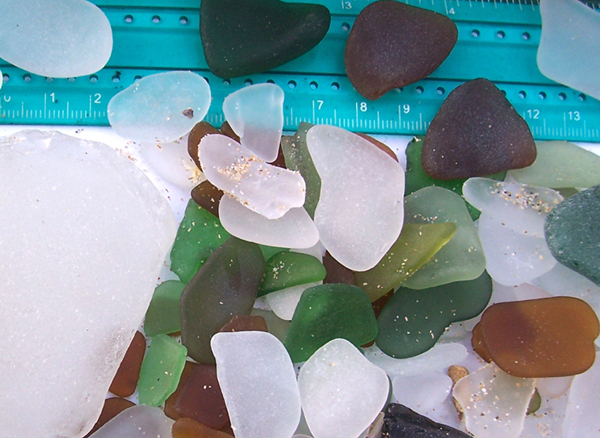 The photos sometimes include a ruler so you can judge the size of the pieces of sea glass. 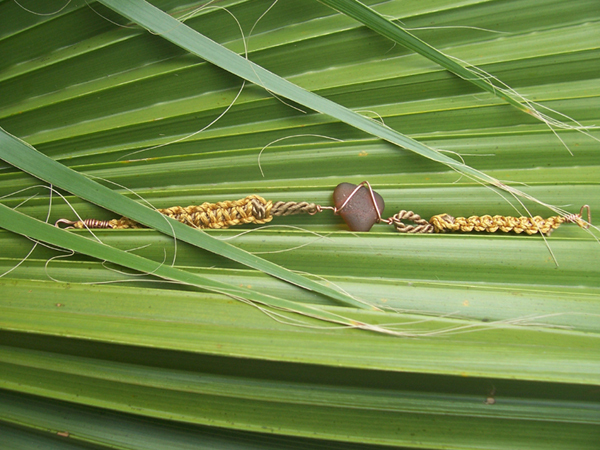 We charge less for pieces that are of a craft quality than we charge for pieces that are of a quality good enough to be used in jewellery items – or of course if you’re happy to use the poorer quality pieces in jewellery items, that’s fine too, and these pieces will cost you a little less than our finer pieces. 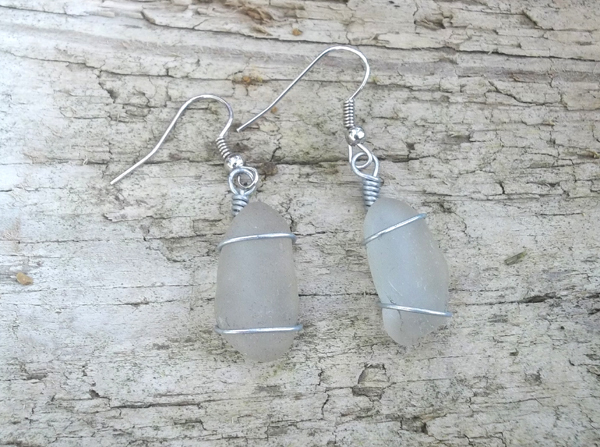 White sea glass is our most inexpensive sea glass as it is the easiest to find. We’re pleased that white sea glass is the easiest to find in the East London area because we consider it one of the best colours. We charge more for colours that are more rare, or not as easy to find as the white pieces are. The photos in this article were taken by ourselves and are owned by ourselves. © Article and photos in article copyright to us, Teresa Schultz and Tony Flanigan 2013.